Global car makers are feeding real-time location information and dozens of other data points from electric vehicles to Chinese government monitoring centres, as President Xi Jinping steps up the use of technology to track Chinese citizens. The data-gathering generally happens without car owners’ knowledge, the Associated Press found. 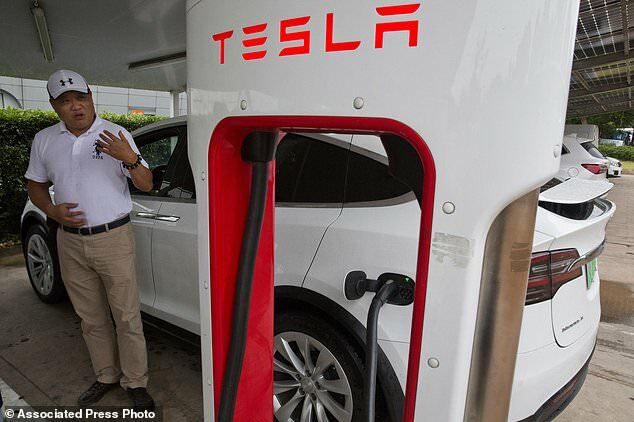 More than 200 car makers selling electric vehicles in China — including Tesla, Volkswagen, BMW, Daimler, Ford, General Motors, Nissan and Mitsubishi — send at least 61 data points to government-backed monitoring platforms, under rules published in 2016. The firms say they are complying with local laws, which apply only to alternative energy vehicles. But critics say the information collected exceeds those goals and could be used to undermine foreign car makers’ competitive position, or for surveillance. 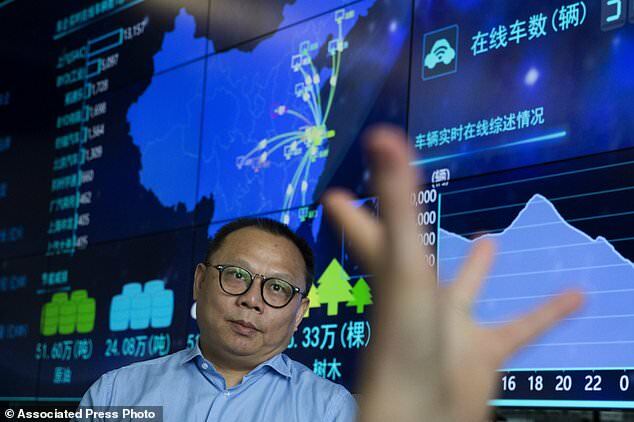 Under Mr Xi’s leadership, China has unleashed a war on dissent, marshalling big data and artificial intelligence to create policing system that can quickly neutralise perceived threats to the stability of the ruling Communist Party. There is also concern about the precedent these rules set for sharing data from next-generation connected cars, which may soon transmit more personal information. 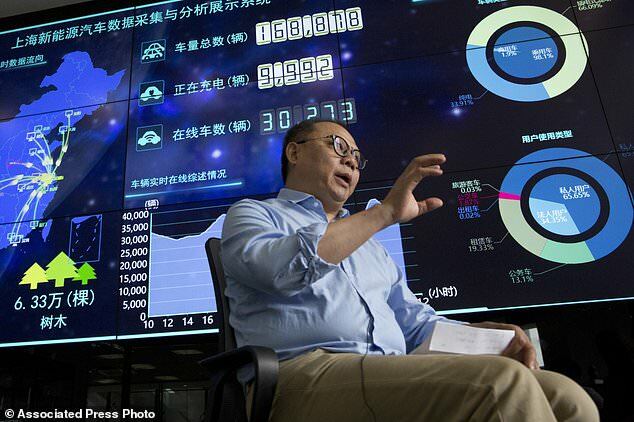 At the Shanghai Electric Vehicle Public Data Collecting, Monitoring and Research Centre, a wall-sized screen glows with dots. 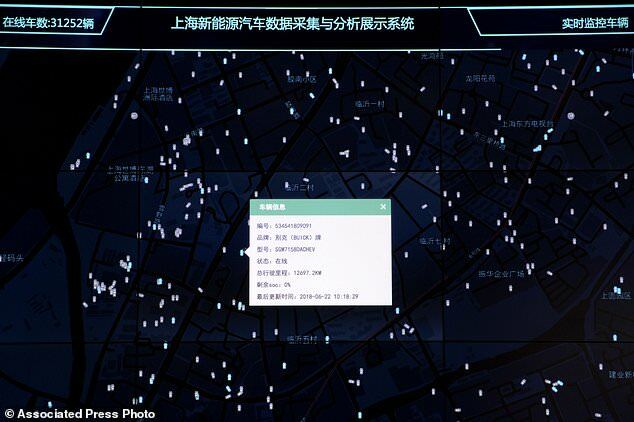 Each represents one of more than 222,000 vehicles connected to the system, coursing along Shanghai’s roads to create a massive real-time map that could reveal where people live, shop, work and worship. 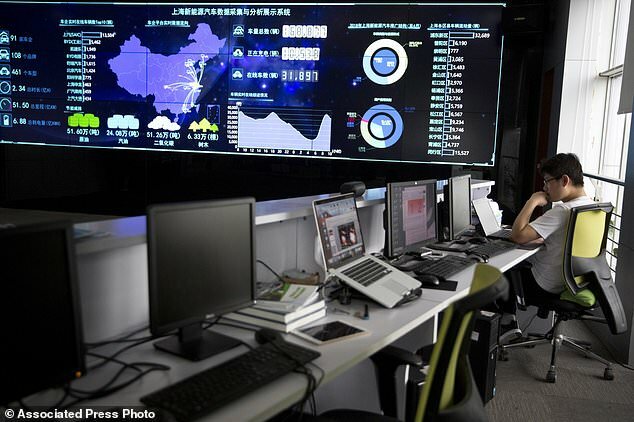 Data also flows to a national monitoring centre run by the Beijing Institute of Technology, which pulls information from more than 1.1 million new energy vehicles. Those numbers are about to get much bigger as Beijing pushes electric vehicle development as part of its ‘Made in China 2025’ industrial development plan. Ding Xiaohua, deputy director of the Shanghai centre, said monitoring is not designed to facilitate state surveillance, though data can be shared with police, prosecutors or courts, if a formal request is made. The centre is registered as a non-profit but is tightly aligned with and funded by the government. 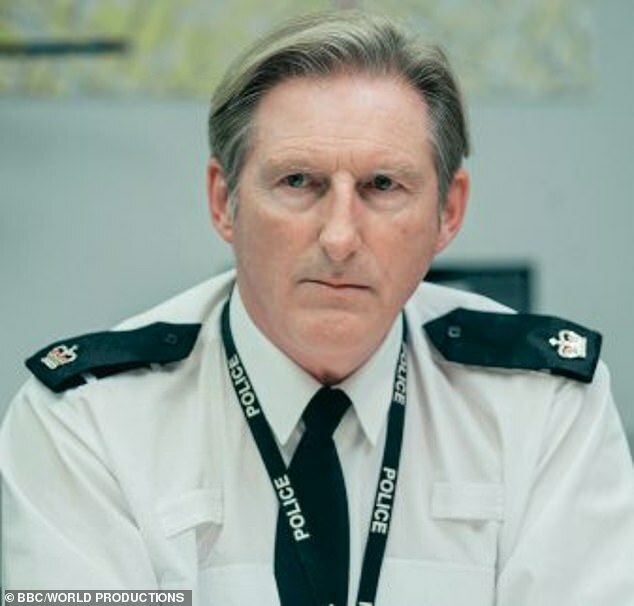 There is a privacy firewall built into the system. 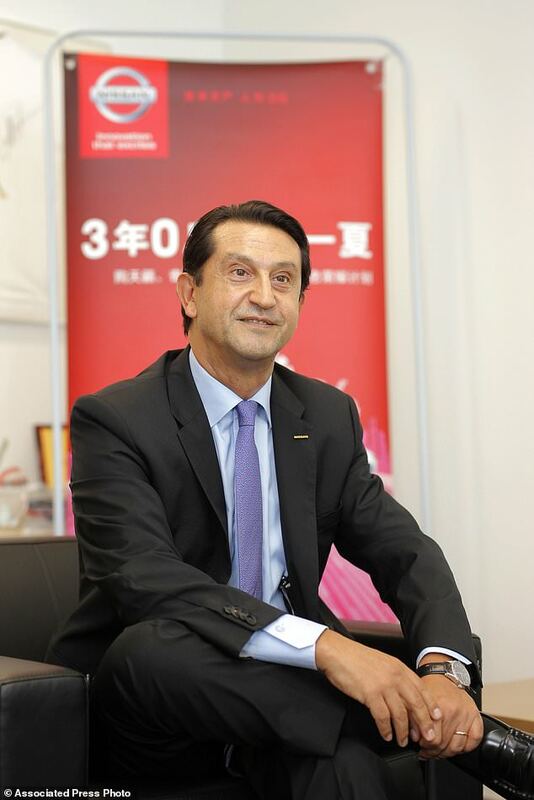 The data centre has each car’s unique vehicle identification number, but to link that with the owner’s personal details, it must go through the car maker — a step it has taken in the past. Chinese law enforcement can also link the vehicle identification number with the owner’s personal information. Many vehicles in the US, Europe and Japan transmit position information back to car makers, who feed it to car-tracking apps, maps that pinpoint nearby amenities and emergency services providers. But the data stops there. Government or law enforcement agencies would generally only be able to access vehicle data in the context of a specific criminal investigation. Car makers initially resisted sharing information with the Shanghai monitoring centre, until the government made transmitting data a prerequisite for getting incentives. The firms stressed they share data to comply with Chinese law and obtain consent from car owners. Nearly all have announced plans to aggressively expand electric vehicle offerings in China, the world’s biggest car market. Volkswagen Group China chief executive Jochem Heizmann said he could not guarantee the data would not be used for government surveillance, but stressed that VW keeps personal data, like the driver’s identity, secure within its own systems. ‘It includes the location of the car, yes, but not who is sitting in it,’ he said, adding that cars will not reveal more information than smartphones already do. WHAT IS CHINA’S ‘EMOTIONAL SURVEILLANCE TECHNOLOGY’? China’s military and a number of its state-owned businesses are using ’emotional surveillance technology’, according to some reports. The programmes use wireless sensors in workers’ caps and hats to monitor their brain activity. When combined with an artificial intelligence algorithm, these readings can detect when employees are feeling depressed, stressed or anxious. Employers can then give workers extended breaks or shift them to simpler placements to help reduce their stress levels. The technology is aiding Chinese firms in boosting productivity and profits, reports suggest. At State Grid Zhejiang Electric Power in the southeast city of Hangzhou, the technology has helped to lift profits by £230 million ($315 million) since it was introduced in 2014.